Abstract: In this article PCSTATS will examine a 760W power supply from Seasonic's flagship modular gaming "X" series. 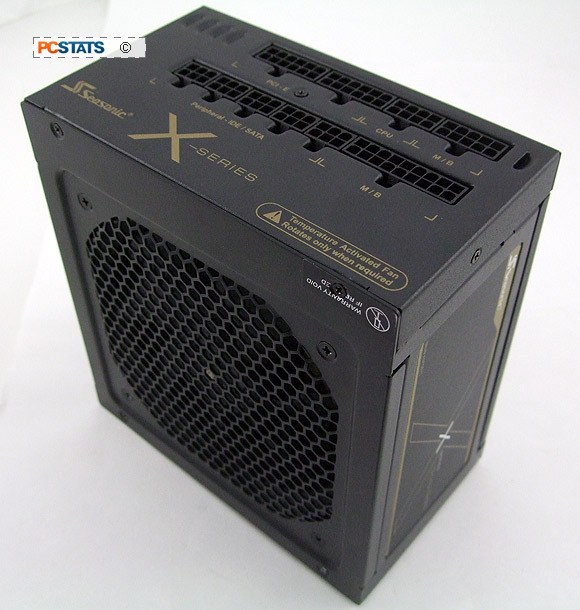 The Seasonic SS-760KM is an Active Power Factor Correction (A-PFC F3) power supply that boasts an80 Plus Gold rating. It features a +12V rail capable of delivering 63 Amps, four 6/8 PCI Express videocard power connectors. The heady days of racing towards 1 Kilowatt power supplies left us with a nice gift - to achieve power densities of 1Kw, 1.2Kw or even 1.5Kw required manufacturers to use better electrical components, develop more efficient circuit designs and devise quieter cooling options. 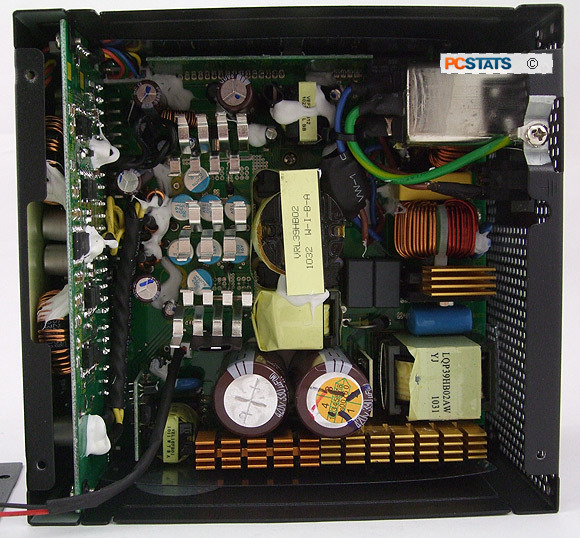 The technological expertise gained from developing those +1Kw enthusiast grade power supplies eventually trickled down to the everyday power supplies we all rely on now. Enthusiasts themselves have also had a hand in shaping modern power supplies, ideas that began as mods talked about on forums include modular sleeved cables, duty reactive fans, matt black PSU chassis and even fan-free thermal solutions. In this article PCSTATS will examine a 760W power supply from Seasonic's flagship modular gaming "X" series. The Seasonic SS-760KM is an Active Power Factor Correction (A-PFC F3) power supply that boasts an80 Plus Gold rating. It features a +12V rail capable of delivering 63 Amps, four 6/8 PCI Express videocard power connectors and the convenience of modular cables. The Seasonic SS-760KM X-760 power supply retails for $180CDN ($180 USD, £90 GBP) at Canadacomputers.com and is covered by a five-year warranty. Under the matt-black steel case and honeycomb air vents are a few clever electrical choices. Seasonic use solid state aluminum polymer capacitors strategically throughout, for greater heat tolerance Japanese 105°C rated caps, to reduce current transmission resistance gold plated terminals. 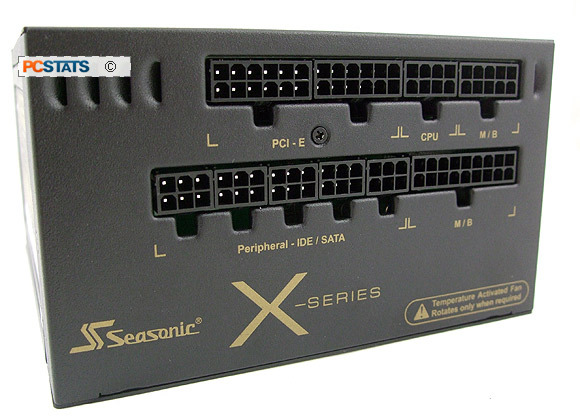 Furthermore, where the modular cables connect to the X-760, Seasonic employ a DC-to-DC converter board rather than a bundle of wires soldered to the modular cable jacks. Seasonic insist that by moving the +3.3V and +5V voltage regulator modules to the connector panel it has minimized voltage drops and impedance, improved airflow by doing away with unnecessary wires within the PSU and aided heat dissipation with a simple, unobstructed component layout. Modular power cables, AC power cable, cable bag, zip ties, velcro cable wraps, mounting screws, instruction manual. Active cooling is provided by a single 120mm Sanyo Denki 'SanAce 120' fan (model: 9S1212F404) that remains off until PSU load demands active cooling. This three phase fan approach is called 'Hybrid Silent Fan Control'. 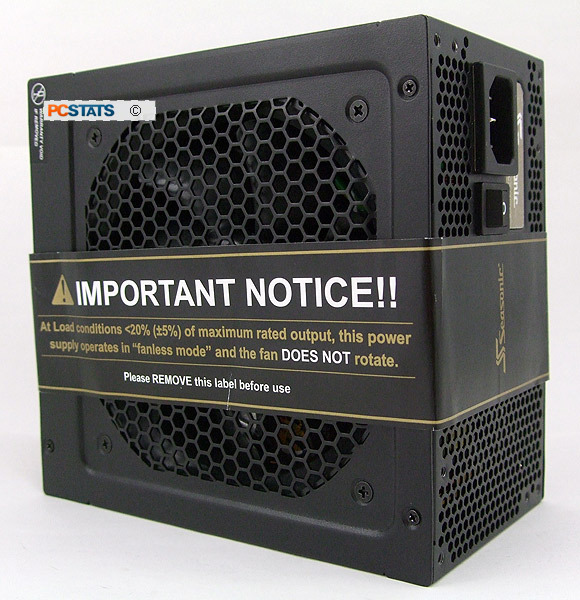 I have to admit that is a bit startling to see the fan stationary while the power supply is powered up... the manufacturer attaches an extra warning label to inform consumers. When the PSU temperature sensor hits 25C the fan spins at ~1000RPM (16 dBA) and beyond that moves to full speed (2200RPM) when PSU load moves past 50%. Sanyo Denki fans are Japanese made, balanced to eliminate vibrations and use ball bearings which are less likely to dry out and seize. The modular cabling of the Seasonic X-760 makes it easy to access components, letting you build a cleaner PC that's less cluttered so airflow is improved all around. As a modular power supply, Seasonic's X-760 is loaded with all the cables necessary to hook it up a multi-videocard equipped system. It ships with four PCI Express power connectors, all of which are convertible 6/8-pin cables. There are eight 4-pin molex connectors, eight SATA connectors and two FDD 4-pin connectors for hard drives/floppy disks and other peripherals. Rounding out the package is one 8-pin EPS12V cables, one 8/4-pin EPS12V/ATX12V auxiliary cable and a 24/20 pin convertible ATX main power cable. Seasonic's X-760 power supply is compatible with ATX 2.2 spec standard and supports the 24 pin ATX power connector by default. Seasonic rates the the +3.3V and +5V rails at 25 Amps each, for a total combined output of 125W. There is a single +12V rail that can output 63 Amps/756W. PCSTATS is often asked what 80 Plus certification means in the real sense. Quite simply, a power supply draws a certain amount of overhead itself to convert 120V AC to a certain amount of DC power. As an example, for a 120W load the Seasonic X-760 should theoretically be 87% efficient and thus draw no more than about 138W in total to get the job done. In other words, an 87% efficient power supply will waste 18W to supply 120W, so the total power draw is thus 18W + 120W = 138W. By comparison a 60% efficient PSU would theoretically draw 200W to supply a 120W load, with a whopping 80W wasted as heat energy. Both the heat and excess power consumption can add up quickly! The Seasonic X-760 measures 160x150x86mm in size so it will fit into any ATX desktop case. It comes in an easy to grip matte black finish with gold accents that will look sharp if your computer tower has a window. It is fully 120V/240VAC compliant, 50/60Hz, so it may be used anywhere in the world. The unit is also impressively hefty, a testament to Seasonic's build quality and choice of high quality materials. Let's quickly get familiar with the outside of the Seasonic X-760 before disassembling it for a closer look at the internal components.